2 women arrested for drugs after traffic stop in Little Egg Harbor Twp. 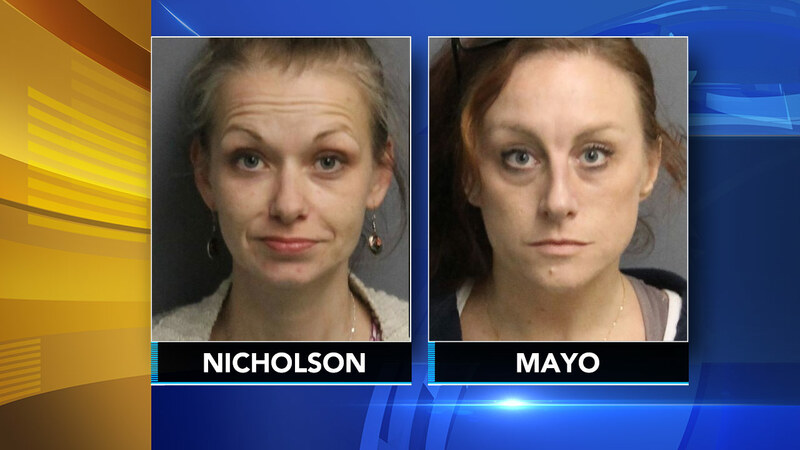 LITTLE EGG HARBOR TWP., N.J. (WPVI) -- Two women were arrested on drug charges after a traffic stop on the Garden State Parkway in Little Egg Harbor Township, New Jersey. State police say Cedar Run resident Emily Nicholson, 34, and Barnegat resident Carey Mayo, 35, were arrested after a traffic stop on Monday, January 22. According to police, troopers stopped Nicholson for a traffic violation at 8:42 a.m. Troopers determined Nicholson was driving under the influence and placed her under arrest. Police say they soon discovered both Nicholson and Mayo were in possession of heroin, drugs known as "bath salts," and hypodermic needles. Nicholson also had a warrant out for her arrest, police say. Both were charged with multiple drug offenses and were released pending a court appearance.